The Environment Court has struck a blow for tree protection. The Government through changes to the RMA enacted in 2009 removed the ability for District Plans to contain blanket tree protection rules. This really worried me. If my worst fears were realised then all trees on private land in Titirangi and Glen Eden that were not specifically scheduled could have been clear felled from January 1, 2012. While the chainsaws may not have been started on day one the provision could mean that over a gradual period of time huge changes could have been made to the area. Almost inevitably there would have been “death by a thousand cuts” as tree after tree was felled. Waitakere City Council and North Shore City Council decided in their final year to seek a declaration on what effect this change would have to their District Plans. 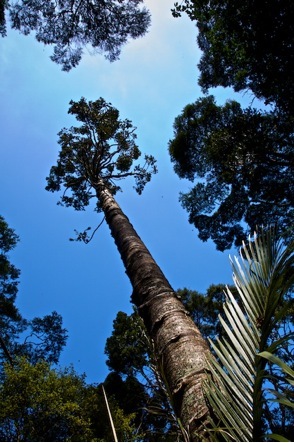 Waitakere Council in particular was worried that areas it had designated as “managed natural areas” should if at all possible be preserved and the application was to see if they could be classified as “groups of trees” under the Act and thereby avoid the cull of protective tree rules that the District Plan contained. Thankfully the Court has agreed. a cluster of trees identified precisely by location; all trees of one or more named species in a defined area or zone; all trees in a class with defined characteristics in a defined area or zone; [and] all trees in a named ecosystem or habitat or landscape”. So landowners in the area will not have unfettered ability to cut down trees. They will continue to have power to trim up to 20% of any tree on their property each year as long as the trimming will not kill the tree. To construct a dwelling and driveway permission can be obtained to clear 500 square metres of bush. Resource consents can be obtained for further clearing and felling of trees but then proper considerations such as the effect on stability and stormwater run off can be taken into account. For an unknown reason Auckland City did not join in the application. I am sure that the new Auckland Council is reviewing all of the regions District Plans to see what protective measures can be preserved. They provide land stability and hold together banks and cliffs. They contribute significantly to the scenic beauty of the area. Imagine if your neighbour decided to cut down every tree including those kauri that you had always admired. They provide a habitat for local flora and fauna. They are carbon sinks. Global warming because of human activity is an almost universally accepted phenomenon and we need all the trees we can grow. They enhance health by protecting humans from prevalent vehicle emissions. They absorb stormwater and prevent excessive runoff putting additional pressure on the reticulated system, as well as preventing erosion. We fell them at our peril. Thanks should be extended not only to the Councils but also the Environmental Defence Society, the Waitakere Ranges Protection Society, the Tree Council and the Grassroots Action Group who all played effective roles in highlighting the issue and in helping to achieve what is the best possible outcome in the circumstances.